A unified metadata service: Users see a single logical view of the environment’s contents without having to know the location and particulars of each component. A directory service: Individual components within the environment, even if they’re relocated or otherwise modified. Security services: These services handle permissions, authentication, and other security needs in a distributed environment. Synthesis services: Unlike traditional Internet usage, for example, where each hit returns information that probably won’t have to be correlated with information from other hits, a virtual data warehouse might have to combine facts from one component with facts from another. 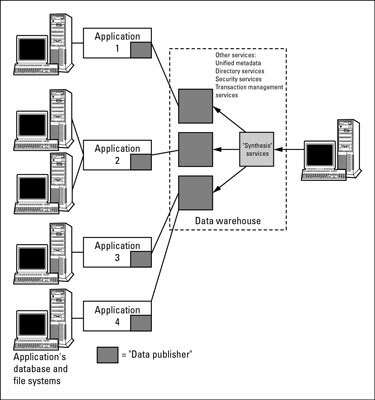 This figure shows a synthesis service component within the virtual data warehouse. If the data warehousing environment, which “knows” that it’s virtually (remotely) accessing data from multiple sources, has a component that handles the synthesis of results from the other components, the responsibility for consolidating these independent results sets can be offloaded from the requesting business intelligence tool.